In late 2277, Star Fleet Intelligence received word that the Klingons were introducing a new class of small, warp-capable combat vessel for system defense, customs interdiction and courier duty. Known as Qongbogh, of “the Wolves”, the new Klingon corvette quickly spread throughout the Empire and became a familiar site to those freighter captains permitted to operate near or within Klingon territory. The propulsion system of the K-41 were considered powerful for both the A and B models, which were launched simultaneously. The KWA-2 and KWB-2 drives were capable of maintaining excellent speed, allowing the corvettes to respond quickly to any potential interdiction requiprements near established ports. Both variants sported the KIB-1 impulse drive, which was well established as a rugged engine. 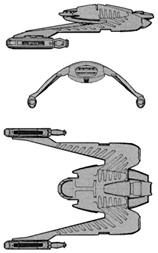 The A and B models both used the KPD-2 pulse disruptor systems as well as being equipped with twin torpedo launchers. The A model was equipped with two KP-1, some of the oldest torpedo technology in the Empire. The B model was fitted with the more powerful KP-5, which had become the go-to medium torpedo of the day. These weapon combinations proved more than sufficient to intimidate most civilian ships and more than a few raiders, escpedially as the K-41s were rarely deployed in anything less than a three ship squadron. Field commanders quickly became adept at using swarming tactics when engaging larger foes. For boarding actions, a fully equipped squad of Imperail Marines were billeted onboard. By 2280, a number of K-41’s had been spotted in open, or “free space” sectors such as the Triangle, suggesting that the Klingons may have been selling them to favored clients. However, only a handful sold to the OFMA were ever confirmed by Star Fleet. The A models were produced at Qro’nos at a rate of 15 per year, while the B model was produced at H’Rez at a rate of 5 per year. While popular and effective, both models ended production shortly after the destrouction of Praxis. A total of 283 A’s and 97 B’s were produced. 8 are listed as missing, including 6 A’s and 2 B’s. 14 are listed as destroyed, including 9 A’s and 5 B’s. 28 A’s and 7 B’s were scrapped, many severly damaged when Praxis exploded. 6 A’s and 2 B’s have been captured (3 A’s and 1 B by the Romulans, 2 A’s by the Cardassians, and 1 A and 1 B by Orion forces in the Triangle). 35 A’s were sold, including 20 to the Nausiccans, 5 to the Orions and 5 to the Suliban. 20 B’s were traded to Son’a. 180 A’s and 40 B’s are in reserve fleets. 19 A’s and 21 B’s are in service to Ranking families in the Empire. Power Units Available – 10 ea. 12 ea.